A community stalwart from Sussex was questioned by Special Branch officers guarding the Home Secretary on Saturday (January 14). Dee Day White said he was stopped by the officers, guarding Amber Rudd as he pushed a wheelbarrow full of military paraphernalia through the Old Town in Hastings for a Dunkirk re-enactment on the beach. He, and an army of volunteers, were behind the recent restoration of the Priscilla Macbean lifeboat. 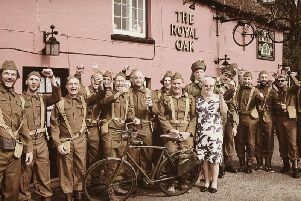 Dee Day said: “I was pushing a wheelbarrow full of old uniforms and kit from my yard in Courthouse Street to the beach. On top was an old World War Two rifle. “I was in the High Street, outside the Jenny Lind pub when four Special Branch officers got out of a car and started questioning me. “They were the protection for Home Secretary Amber Rudd, who was having breakfast at a cafe nearby. “They were very anxious and concerned about the gun and were asking if I had a licence for it. I told them I didn’t and it was a military piece that had been de-activated. I explained they were props for a film we were making about the restoration of the Ghost of Dunkirk lifeboat. I told them Amber knew who I was and would vouch for me. “After a while they let me go but one of the officers said to me ‘You have to see it from our point of view. The Home Secretary is in a cafe close by and someone walks past with a rifle’. Film footage shot on Hastings beach can be seen tomorrow (Friday, January 20) when it forms part of a film show and concert, at St Mary in the Castle, which is being held to raise funds for the ongoing restoration of The Cyril and Lillian Bishop.